So when the Scriptures say that the disciples went with him to Jerusalem, that means we women went, too. We stayed with him all the way to the cross, and I was one of the women who came to his tomb. I was the very first to see him in the garden. Then he sent me to the other disciples – to tell them the Good News, that he had risen. There are other texts from those early years, not in the Bible but just as old, that say I was one of the apostles – that is, one of the ones sent out – to proclaim the Good News to the world. In those other texts, I am not only the first witness to his resurrection, I am a leader among the disciples. So what happened to me? After the first centuries, the official church took those few verses about me and combined them with verses about other women, to tell a new story about me. There were many Marys in the Gospels – so which one was I? 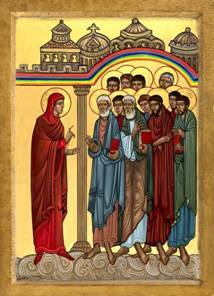 Was I Mary the disciple? Was I Mary the loose-haired prostitute? Was I the Mary who anointed him for burial? The church took all these Marys, including me, and wove them into a new story. And in that story I became a seductive woman and a repentant prostitute. But you should know it took 600 years for the church to do this, because Jesus had changed the way his first disciples looked at women. Jesus’ way of treating us was one of the many things that set him apart. He did not ignore women. He refused to reduce women to their sexuality. He treated women with respect, as equals in his community – and so we were disciples, too. How would the later church cope with this Jesus? You might say the church just decided to forget the Jesus who always welcomed women. But it was more than forgetting; it was also a new story, especially about me. Out of a few details – some real, some imagined – the ointment, the long hair, the weeping, the intimacy at his tomb – an entirely new character was created for me. I’m sure all the changes made me more interesting – a sexier woman – than the person I really was: a woman who was a serious disciple, a woman who was a teacher and preacher, a woman of the Spirit. So who am I today? Oh, I am still alive in the secular imagination – a few years ago they even put me into a rock opera, in which I sing, I don’t know how to love him… He’s just a man, and I’ve had so many men before… I want him so. I love him so… That’s a great love story, with timeless appeal. And today you can also find me in a popular novel – and in a film of the same name – as the secret wife of Jesus and the mother of his only child. That story also has timeless appeal, doesn’t it? It’s a great mystery – who was I? where did I go? and what happened to my precious child? Yes, the Da Vinci Code says that the great Good News of Jesus was not that he sent the Holy Spirit as his gift for everyone in the world – but that somewhere, just one person received his gift, just one person still carries his genetic inheritance through the child I bore once him. Now let me tell you the real story. Here’s all you need to know about me: I was a woman from rural Galilee. I was independent – my father was gone; my husband was gone; I had no brother to keep watch over me. But I was not poor; my family had left me more than enough to live on. So I had a better life than most women in those days. But still, I was in great need of healing. What was wrong with me? Do my illnesses really matter now? What matters is that Jesus healed me. So I loved him – and so I followed him. I went with him and all the other disciples, as he taught and healed so many others. When we traveled, we helped feed everyone. When we reached Jerusalem, we entered the city with him. When they dragged him to the cross, we stood by him. And as soon as that sabbath was over, we went to anoint his body, but the tomb was empty. What would you have done? I stood there in shock, wondering what they had done with his body. And then he was there – he didn’t look quite the same and at first I thought he was a gardener, but then he spoke to me. He just said, “Mary.” And when I heard his voice, I knew it was him – I knew that amazingly, impossibly, he was alive. And then he sent me to the other disciples to tell them his Good News. The real story has always been about Jesus, not me. What was he like? He was a man who was filled with the Holy Spirit. When he prayed in silence, you could see that he lived in communion with the Spirit; when he prayed out loud, you could hear the love in his voice. When he taught us, he taught with authority – he didn’t just quote the Scriptures, he knew them! He was a man who was filled with compassion. When the sick came to him, he healed them; a blind man beside the road was important to him; a woman hemorrhaging was worth his time; a pleading leper was not untouchable to him. When the sinful came to him, he welcomed them – he even ate with them. He was a man who was filled with wisdom. When we asked him about power, he taught us to seek for God’s kingdom instead; when we asked him about money, he taught us to give it to the poor; when we asked him about success, he taught us to follow him. He was our friend who loved us, and we loved him. And after he died on the cross, we thought he was gone from us forever. But in the days and weeks after the cross, he appeared again and again to us. He spoke to us; he taught us; he showed us how to move forward. And as the weeks went by we learned: whenever we gathered to remember him, his Spirit was there with us. How do I know it’s the Spirit of Jesus? Have you ever been a in a room with people who’ve gathered to listen for his Spirit? In the silence, in the peace, in the common trust, the Spirit of Jesus is there. Have you ever been in a dark room – so dark you cannot see anything – when someone you love comes into the room? Even though you can’t see someone, you can feel their presence when you know them so well. Have you ever heard the voice of someone you love, and even though you can’t see them, you know who it is because you know their voice? Or – have you ever been in your own inner darkness, in despair but still but hoping for hope to come again – and in the darkness found a spirit of assurance, a spirit of compassion, a spirit of love? If you have met Jesus, then you would know his Spirit anywhere. If you have met Jesus, you will always know when his Spirit is with you. And he will be with you, because – as I learned on the Day of his Resurrection – he is alive! When they began to embellish my story, they forgot that his Spirit is alive, and still speaks to everyone and to anyone. And they also forgot that the Spirit needs everyone and anyone for the world to fully hear Jesus’ voice. At our Last Supper together, when Jesus prayed for his disciples* he was praying for his people everywhere. He prayed that we would stay together – that men and women would work together, that rich and poor would serve together, that Jews and Gentiles would listen together. He prayed that people of every race and language would each speak their own truth, tell each other what they have heard, and then listen again for the Spirit’s way forward. But everyone is needed to hear the full voice of the Spirit. If you leave the women out, you will hear only half the story, because the Spirit lives in women, too. If you leave the children out, you won’t see his Spirit shining in their faces. And if you leave the poor out, you won’t hear his voice, because he lives among the poor. What would the church be like today, if we had all tried to remember his prayer?